Time for another cookie recipe. I took a few days off from posting cookie recipes. Not because I don't have any left, but because I have been busy just like everybody else this holiday season. The past two and half weeks have seemed to fly by, except for the hours I spend at work which seem to drag on and on. This tends to happen when I have something to look forward to. Right now, like many of you, I have a lot to look forward to. Not only is Christmas next week and I am taking two weeks off from work, but I am also going to visit my boyfriend's family in West Virginia (which I love doing) and my sister is getting married on December 27th in New Orleans. I happen to be her Maid of Honor and am getting pretty excited for her big day. It only seemed appropriate that I save this recipe for when I mentioned my sister's wedding. These are Mexican Wedding Cookies. I have had these a couple times here and there growing up, but not any time recently. Then my friend Maria brought theses cookies to the cookie exchange I hosted. They are great little cookies; buttery, sweet, and nutty. I don't get too many comments on these posts most days, but in the spirit of the Holidays how about sharing what you are looking forward to most in the next few weeks. In a medium bowl, cream the butter and sugar. Stir in vanilla and water. Add the flour and almonds, mix until blended. Cover and chill for 3 hours. Shape dough into balls or crescents. Place on an unprepared cookie sheet and bake for 15 to 20 minutes in the preheated oven. Remove from pan to cool on wire racks. When cookies are cool, roll in confectioners' sugar. Store at room temperature in an airtight container. The best way to describe these treats are simple and delicious. They contain three ingredients and take moments to make. I saw these online Bakerella's site and thought to send the link to my friend Cat. She made them for the cookie exchange and they were a hit! To enhance the holiday theme she used mint Oreos which really made them special. I definitely recommend these to anybody who loves Oreos or Cakeballs. They really could not be any easier so they are great for a beginner cook. My one tip would be to not use white chcolate chips to coat these if you have not worked with it before; it is much easier to use chocolate bark. Finely crush 7 cookies in a food processor or place them in a ziploc bag and crush into a fine consistency. Reserve for later. Crush remaining cookies and stir in softened cream cheese. Use the back of a large spoon to help mash the two together. Roll the mixture into 1" balls and place on wax paper covered cookie sheet. Melt chocolate as directed on the package and then dip balls into chocolate, tap off extra and set aside on wax paper covered cookie sheet to dry. You can sprinkle the tops with the 7 crushed cookies for decoration (Cat used red and green sprinkes). Once dry, refrigerate and enjoy! My friend Farah brought these cookies to my cookie exchange party this past weekend. These cookies are everything you want in a shortbread. Believe it or not I never really knew I was a shortbread fan until this past year. Now I can not get enough and these cookies fit the bill. You can top them with any kind of nut or morsel. Farah used chocolate chips and peanuts which were the perfect addition to the shortbread. I hope you can give them a try sometime. Preheat oven to 375 degrees F (190 degrees C) with the rack in the middle of the oven. Have ready a baking sheet that is either buttered or lined with parchment paper. In the bowl of your electric mixer (or with a hand mixer), cream the butter and sugar until smooth (about 2 minutes). Beat in the vanilla extract. In a separate bowl whisk together the all purpose flour, rice flour, and salt. Add this mixture to the butter and sugar mixture and beat just until incorporated. Transfer the dough to the baking sheet and form into an 8 1/2 inch (21 cm) round. Gently press the chopped nuts and chopped chocolate into the dough. Place in the preheated oven and bake until it is golden brown, about 20 to 25 minutes. Cool completely on a wire rack. As far back as I can remember my mom has made spritz cookies for Christmas. She would make hundreds and hundreds of these cookies. She would fill decorative tins and then give them away as gifts. 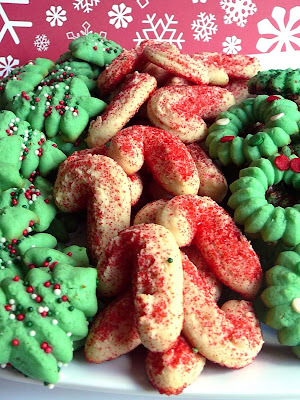 I remember one year, we found a tin full of these little cookies months after Christmas and they looked like they were baked the day before. Now, they were hard as rocks, but still adorable. Since I am not going to be home with my mom around Christmas this year (we are going to New Orleans for my sister's wedding), I decided I would make these spritz cookies for my cookie exchange party. The cookies are simple and not too sweet. You can easily eat a dozen before you realize. I hope you enjoy my family tradition! Preheat oven to 350 degrees F (175 degrees C). Mix together the flour, salt, and cinnamon; set aside. In a medium bowl, cream together butter and cream cheese. Add sugar and egg yolk; beat until light and fluffy. Stir in the vanilla. Gradually blend in the dry ingredients. If desired, decide the dough in half and add food coloring to the halves until you reach the desired color (I used about 8 drops of green food dye). Fill a cookie press or pastry bag with dough, and form cookies on an ungreased cookie sheet. Sprinkle with colored sugar or sprinkles to decorate. Bake for 12 to 15 minutes in the preheated oven, or until the cookies are golden brown on the peaks and on the bottoms. Remove from cookie sheets at once to cool on wire racks. As promised, here is the second recipe from the Cookie Exchange I hosted this past weekend. These cookies were made by my friend Marjorie and I can vouch they were more impressive than they look. By appearances alone, they make seem a little boring, but the flavor is exceptional. They have all the sweetness and spice of a traditional gingerbread cookie without the dryness. They really do speak to their name "Big Soft Ginger Cookie. My friend who made these and I were talking earlier this week and think the cookies would also be good with a glaze drizzle. If you go that route it is really only for looks, because the taste is great as is. Preheat oven to 350 degrees F (175 degrees C). Sift together the flour, ginger, baking soda, cinnamon, cloves, and salt. Set aside. In a large bowl, cream together the margarine and 1 cup sugar until light and fluffy. Beat in the egg, then stir in the water and molasses. Gradually stir the sifted ingredients into the molasses mixture. Shape dough into walnut sized balls, and roll them in the remaining 2 tablespoons of sugar. Place the cookies 2 inches apart onto an ungreased cookie sheet, and flatten slightly. Bake for 8 to 10 minutes in the preheated oven. Allow cookies to cool on baking sheet for 5 minutes before removing to a wire rack to cool completely. Store in an airtight container. The first cookies from the exhange. These cookies are brought to you by my lovely friend Maria. Unfortunately I never got a chance to taste these cookies. I did not eat one yesterday because I was stuffed. Apparently they must have been good because they were the first to go at work. Now without further adieu, the recipes is below. Preheat oven to 350 degree Fahrenheit. Combine ingredients. Roll into 1" balls, roll balls in sugar. Bake on cookie sheet for about 10-12 minutes. Top with chocolate Kiss immediately upon removal from oven. So I hope you guys like cookies because you are going to be inundated with them over the next couple weeks. Today I hosted a cookie exchange with some girlfriends and managed to take photos of each of their cookies. I am going to post every few days to make sure they all get posted by Christmas. 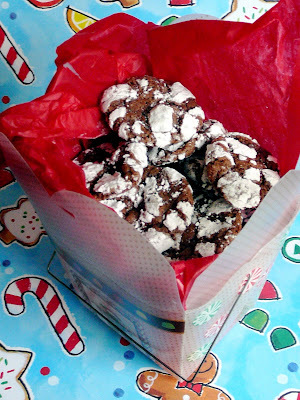 To start the cookie parade, these cookies are traditional Chocolate Crinkle Cookies. They were not part of the cookie exchange; I actually made these for a co-worker last week. Make sure to check back every few days for the cookie exchange recipes. You see we had been working crazy hours back in October and early November. Now when I say crazy, I mean crazy. We did not have a day off for almost a month, we often worked 15+ hour days, and I even had to work on my birthday (which was a Saturday). So when we were working these long hours I told my co-workers I would make each of them a special treat; whatever they requested. This one co-worker only requested a chocolate cookie so this is what I went for. I am not a huge powder sugar person and thought these cookies were good, but not the best I ever had or anything. Well the people at work thought otherwise. In fact one person told me they were the best thing I ever brought in. They were gone before I knew it. In a medium bowl, mix together cocoa, white sugar, and vegetable oil. Beat in eggs one at a time, then stir in the vanilla. Combine the flour, baking powder, and salt; stir into the cocoa mixture. Cover dough, and chill for at least 4 hours or in the freezer for one hour. Preheat oven to 350 degrees F (175 degrees C). Line cookie sheets with parchment paper. Roll dough into half inch balls. Coat each ball in confectioners' sugar before placing onto prepared cookie sheets. Bake in preheated oven for 10 to 12 minutes. Let stand on the cookie sheet for a minute before transferring to wire racks to cool. Makes approximately 72 cookies.